Make the message stick with Fire Prevention Week™ Magnets! Bring extra exposure to this year's Fire Prevention Week theme just about anywhere you can find a metal surface. From the kitchen refrigerator and magnetic bulletin board to decks, lockers, and cabinets, FPW™ Magnets are a small but powerful tool for promoting public safety. 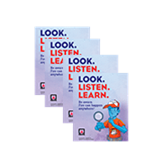 These colorfully designed magnets feature our newest advocate for fire prevention, Simon, along with the message to "Look. Listen. Learn. Be aware. Fire can happen anywhere.™" Not only are these magnets a favorite giveaway for both children and adults, but they're also affordable enough to fit almost any budget. Fire Prevention Week serves to remind all of us that keeping our communities safe is a year-round responsibility. Long after FPW 2018 is over these charming magnets will continue to re-enforce the essential steps to reducing hazards and having an escape plan in case of a fire.